The Future of Libraries – We also have books | Damian Trasler's Secret Blog - Do Not Read! If someone offers you Oz, why would you want to run back to Depression-Era Kansas? This week I was invited to attend a presentation on the Library Services Plan, or something equally vague. I assumed that it would be a thirty-five slide show on Powerpoint detailing circulation figures, looking at areas of economy and target demographics. I assumed, in short, that it would be dull and have little to do with me, a lowly Circulation Clerk. The presentation was given by Stephen Abram, MLS. He’s a tall man, with a lively voice and a tendency to speak bluntly. He is also, it quickly becomes clear, passionate about libraries. But not in a “Sacred Halls of Silent Education and Reading” way. The physical building, the actual books on the shelves are the smallest part, the least part of the library. I wanted to write down some of the figures he was giving out, but I didn’t make enough notes simply because I wanted to listen and see what he was putting up on the projector. He talked about experiments he had run with libraries in America, where they’d got liquor licences for reading groups and quadrupled attendance. About persuading one Children’s Librarian to give her Storytime a Facebook page and turned it from a 30 child event to a 120 child event. He pointed out that the number of people who actually come in to the library is only a small fraction of the number who use the online facilities, and what were we doing to make THOSE more welcoming, more engaging? His ideas, his enthusiasm and his unerring belief that tremendous change was not only inevitable but good, was a message I hadn’t heard before. I’ve worked in a number of different environments, and change is usually viewed as something to be managed. Stephen’s main point was that you don’t manage change: You manage your response to it. Change is coming, it’s inevitable. How you react to that is what you can control. Our instinct in the face of change is to assemble facts and numbers. In the Civil Service, this was usually to do with jobs and budgets. Here’s our productivity, here’s how much we’ve had to spend. We can’t afford to be the area that’s cut, either in terms of manpower or funding. It was a losing battle, since budgets were always being cut, and the reason was usually that departments wasted money ENSURING they spent their entire budget so that it wasn’t cut the following year. Stephen suggested ignoring the numbers. What’s the point of holding up circulation numbers for inspection? DVDs are a big circulation item at the moment, but that’s because the rental shops have closed down. Why have they closed down? Because online streaming services are proliferating. It’s easy to predict that the DVD demand in the libraries will begin to fall, just as VHS demand fell a few years ago. Does that mean we should lose funding because we can’t provide figures? Libraries aren’t books and DVDs. Libraries are a place that you bring the questions you have AFTER you’ve asked Google. Libraries are meeting places, they are community centres, they are places to access databases, place to make things, to learn hobbies and skills, to form new groups, to teach the things YOU know to others. The libraries I work in are all in areas that have high numbers of immigrants (Let’s not forget, I’m one myself). They come to the library within days of arriving in Canada. Getting a library card, getting access to the library and all it provides is viewed as an essential step in making their new life. They come to the library for help with language issues, with Canadian customs and traditions, for Jobs workshops, for schooling, for local information…. I watched the Chief Librarian during the presentation. She was thoroughly engaged in the process and that gives me great hope. If the people at the top are ready to embrace the change, to push the library and its staff out of the comfort zone, then I might just have arrived in a job that isn’t going to end in the death of the company for a change. 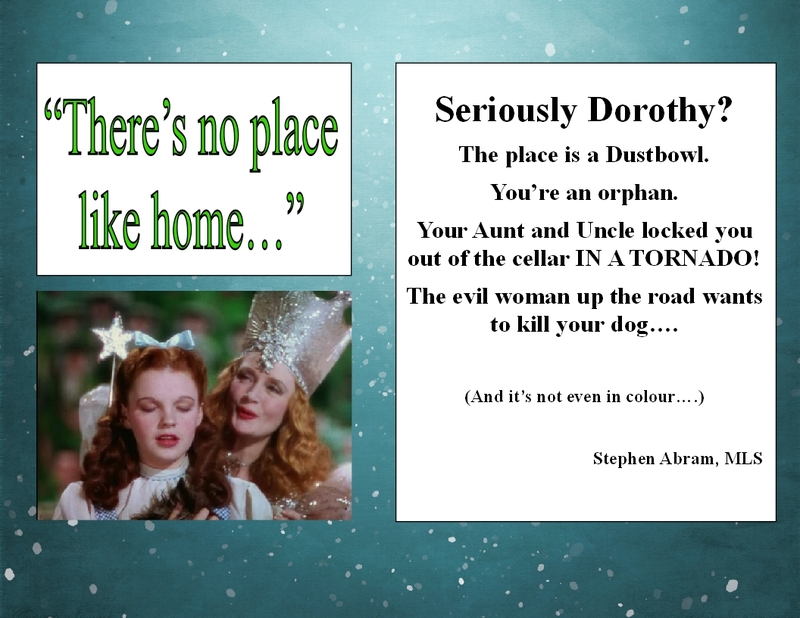 We all saw Oz at that presentation – the glittering, Emerald City. It looked beautiful, though the road may be long and have the odd Flying Monkey to dodge. Still, I’d rather be there than in a dusty, black-and-white farmhouse in the Dustbowl. This entry was posted in Book reading, Emigrating with Weasels and tagged BPL, Burnaby Public Library, Change Management, libraries, Library, Oz, Stephen Abram, the future of libraries. Bookmark the permalink. Wow, wine and Facebook. Fascinating ideas! My own library is putting forth a new book club idea called Books N’Brunch. They select two books – one fiction one non – and readers can read one or both books and then meet for brunch at a place that has something to do with the books with a guest speaker to talk about the topics. For example, this saturday, readers read The Pillars of the Earth and Basilica. We’re meeting at the Guadalupe Shrine and an architect is speaking about cathedrals. I’m really excited to go. That sounds excellent! If you don’t mind, I may borrow that idea and pass it along…. Go right ahead! I’d hate to see libraries shut down. Very interesting! Our town is having a bond election soon to upgrade our public library, and I noticed that meeting places, a snack bar with WiFi, and a larger teen area are among the changes proposed. I also have noticed a trend toward more online services. All of which I think are great — looking toward the future. Thanks for highlighting this! I know some people believe the ebook proliferation signals the end of libraries, but I believe they will remain an integral part of our communities, just in a different format.